When I lived in Dawson in 1975–1976, I never heard of this fantastic claim. Yet I spent a significant amount of time working for the Dawson City Museum where, one might imagine, other artifacts might have been acquired—if any there were—of such a stunningly early and advanced civilization. (The earliest-known civilization was Sumer in Mesopotamia, dating to about 3,500 bce.) Nevertheless, coming across Ferrell’s mystery tale, I was determined to investigate. The coin was discovered about a year after the end (as most sources reckon) of the great Klondike gold rush. That stampede was triggered after George Washington Carmack and two Native American companions, known as Skookum Jim and Tagish Charlie, discovered gold on August 16, 1896. (Jim was the brother-in-law of Carmack, whose common-law wife Kate was on the expedition though not prospecting.) The discovery was made on Rabbit Creek, which was soon renamed Bonanza. 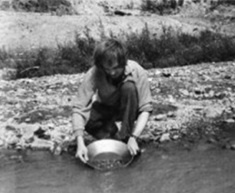 The Klondike’s other gold-bearing creeks radiated like spokes of a wheel whose hub was a bald mountain called King Solomon’s Dome or simply The Dome (see Figure 1) (Morgan 1967, 132–142; “Klon­dike Gold Rush” 2015; Sack 1974, 3–7). The following year, the stampeders came by the thousands, raging with Klondike fever. They arrived by land, or boat, or a combination, being required by safety-minded Canadian authorities to have a year’s worth of food—part of a typical ton of equipment and supplies. An entire tent town sprang up; so did a sawmill, and soon a clapboard Dawson City stood on the site (Sack 1974, 3–18). Banners and cloth signs proliferated (wood being scarce but cloth from tents being readily available). They proclaimed: “Gold Dust Accepted,” “New Tents,” “Dogs,” “Laundry,” “Meals 5¢,” “Saloon”—even “Fancy Dress Making” and “Fortunes Told $1” (Nickell 1994). Moneymaking schemes were everywhere. When the majority of stampeders arrived in 1898, the most productive creeks had all been staked—with nearly 10,000 claims recorded by July. Some enterprisers amassed numerous claims, buying and selling, and hiring the “Cheechakos” (newcomers) to do the work. Others who missed out on becoming miners set up businesses catering to miners’ needs or worked for those who did (“Klondike Gold Rush” 2015; Morgan 1967, 139, 141). News was in great demand, as shown by a surviving copy of a handwritten newspaper. The first daily paper was issued by the Midnight Sun, beating the Klondike Nugget whose editor had arrived first but awaited his equipment. He was still waiting, apparently, when The Dawson Miner came off the press. During the winter of 1898–1899 the Nugget was finally printing but forced to use wrapping paper rather than newsprint. (The editor eventually went bankrupt.) In 1899, the Dawson Daily News debuted, and the next year, on August 28, that paper published the article of interest to us, “Ancient Coin Found: A Puzzle to Students” (Morgan 1967, 139; “Klondike Gold Rush” 2015). It is about the size of a copper cent,2 though not more than half as thick, and is apparently of brass, of some combination of copper and zinc. Both sides are covered with strange characters resembling heiroglyphics [sic] to the untrained eye, and the edge is milled as artistically as “the dollar of our daddies.” A peculiar thing about the coin is that it does not appear to be worn at all, the edges of the heiroglyphics [sic] being as sharp and clear cut as a new twenty-dollar gold piece. It was made with a die like modern coins. In fact, this does not sound like an ancient coin at all. Not only did it have a freshly minted look, but it bore a milled edge. These features are evidential, as will be apparent from the following brief timeline of currency and coins. In the earliest agricultural times, cattle were used for currency (about 7,000 bce). Metal money, formed of bronze ingots that were frequently cattle-shaped, and of varying weights to denote values, appeared several millennia afterward (circa 2,000 bce), and still later bronze was superseded by the precious metals silver and gold and by other shapes, such as cat heads in Egypt (ca. 1,000 bce). A natural alloy of gold that was up to 35 percent silver, known as electrum, was used to make bean-shaped ingots bearing a punchmark that signified the value, thus eliminating the need to weigh them. The first true coins were produced by the Lydians, about 640 bce; with a punch, they hammered into the soft metal the image of a man or animal that would signify the coin’s worth (Panati 1984, 169–170). Such coins could have precious metal shaved off the edges, thus cheating the recipient. To end this practice, milled edges were invented, being introduced in the late seventeenth century (Panati 1984, 169–170). Considering the features of our questioned artifact—the milled edges, the use of dies to form the faces in relief, and the lack of wear—we can infer a relatively modern coin, or even a token. (Tokens often had milled edges too, not to prevent metal shaving but to impart a quality look.) It would have been of relatively recent manufacture, minted no earlier than about 225 years before it was discovered, and in fact might have been quite recent. So the only supposed “evidence” of a fabulously ancient civilization existing, long before any known historical record, is the allegation that a coin (which is not in evidence, was not expertly examined, and which even so appears to be modern) was found where it should not have been—under prehistoric ice. A number of coins and other artifacts attributed to ancient civilizations have occasionally turned up in North America, some of which have been hoaxes. Again, a “Norse penny” of 1065–1080 c.e., found at an archaeological site in Maine, was the only non-Indian artifact there and probably came from the north by trade with the Vikings. Their site at L’Anse aux Meadows at the northern tip of Newfoundland (where I have investigated) dates from about 1000 c.e. (Fort 1974, 147–160; Feder 1996, 89–118). Even in the Yukon, three Chinese coins have been discovered, one as old as 1403–1424, but these appear to have either been brought by prospectors who carried them as amulets or to have come from earlier trade: China to Russia to Pacific Northwest Indians (Lorenzi 2012). Taken together, the evidence indicates that the “ancient coin” in question may have been either a coin or token, dated no earlier than the late seventeenth century. The “heiroglyphics” [sic] might have been anything from Chinese ideograms to Masonic symbols. (The apparent copper-and-zinc composition would be consistent with such coins or tokens.) At the time of its discovery—based on the newspaper report alone—a journal of coin scholarship labeled the claim a “whopper” and placed it under “Fairy Stories,” concluding, “Somebody up there is playing on credulity of the people” (see The Numismatist 1899–1900, 278–279). The original newspaper story had concluded: “Evidences of a former race having inhabited this section are unfortunately rare, but only on a few creeks has work been done, and then only to an upper bedrock beneath which is a sub-stratum of gravel superimposed on a second and probably primitive bedrock. When this is penetrated additional evidences of early occupation will probably be found” (“Ancient” 1900). In fact, they were not. Although the gold rush had ended, mining continued—including dredging operations from 1906–1966, with millions of dollars sent to the market annually (Sack 1974, 18–21). No trace of the imagined civilization has ever been uncovered. Thanks to Tim Binga, CFI Libraries Director, and Melissa Braun for their repeated assistance with research for this investigation. The reference to “copper cent” is probably to the American cent. The Canadian one was bronze and larger (about the size of a current American quarter). The other references to coins in this paragraph must also be to American coins, because Canada did not yet have a silver dollar or a twenty-dollar gold piece. (See Berman and Malloy 1995, 21–22, 59–60, 75–78, 167–168, 178, 184.) In 1898, ninety percent of Dawson City residents were American (Morgan 1967, 141). Berman, Allen G., and Alex G. Malloy. 1995. Woman’s Coins & Currency: An Identification and Price Guide to Ancient, Medieval, and Modern Coins and Currency, Including Art Medals, Bank Checks, Commemoratives, Mint Sets, and Tokens. Radnor, PA: Wallace-Homestead Book Co.
Daegling, David J. 2004. Bigfoot Exposed: An Anthro­pologist Examines America’s Enduring Legend. Wal­nut Creek, CA: AltaMira Press. Davis, Jeff, and Al Eufrasio. 2008. Weird Washington. New York: Sterling Publishing. Feder, Kenneth. 1996. Frauds, Myths, and Mysteries, 2nd ed. Mountain View, CA: Mayfield Publishing. Ferrell, Ed. 1996. Strange Stories of Alaska and the Yukon. Kenmore, WA: Epicenter Press. Fort, Charles. 1974. The Complete Books of Charles Fort. New York: Dover Publications. Klondike Gold Rush. 2015. 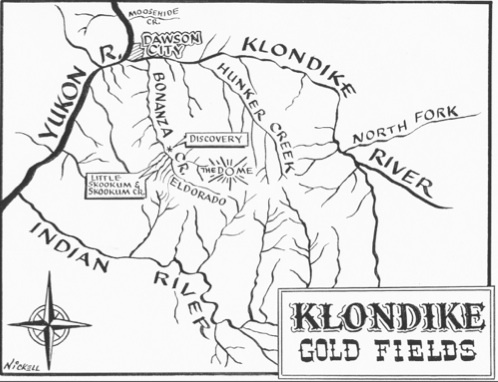 Available online at https://en.wikipedia.org/wiki/Klondike_Gold_Rush; accessed July 30, 2015. Lorenzi, Rossella. 2012. Ancient Chinese Coin Brought Good Luck in Yukon; November 27. Available online at http://news.discovery.com/rossella-lorenzi.htm; accessed July 31, 2015. Meldrum, Jeff. 2006. Sasquatch: Legend Meets Science, New York: Tom Doherty Associates. Morgan, Murray. 1967. One Man’s Gold Rush: A Klondike Album (Photographs by E.A. Hegg) Seattle: U. of Washington Press. Nickell, Joe. 1994. Klondike gold rush photos. In Camera Clues: A Handbook for Photographic Investi­gation. Lexington: University Press of Ken­tucky, 64–66. prospectorl.html; accessed July 29, 2015. The Numismatist. 1899–1900. Volumes 12–13: 278–279. Panati, Charles. 1984. Panati’s Browser’s Book of Begin­nings. Boston: Houghton Mifflin Co.
Sack, Doug. 1974. A Brief History of Dawson City and the Klondike. Whitehorse, YT: Yukon News Printers.Skookum. 2015. Available online at https://en.wikipedia.org/wiki/Skookum; accessed July 30, 2015.